Background: Among the various metal nanoparticles, plant extract-based silver nanoparticles are gradually getting preference because the bioreduction potential of plant extracts is much faster for silver ions. The silver nanoparticles have the bactericidal activity and have shown to possess anticancer potential for developing effective and safe novel therapeutic agents. Objectives: The objective of the study was to synthesize Curcuma longa silver nanoparticles for the induction of anticancer activity in breast cancer cell. 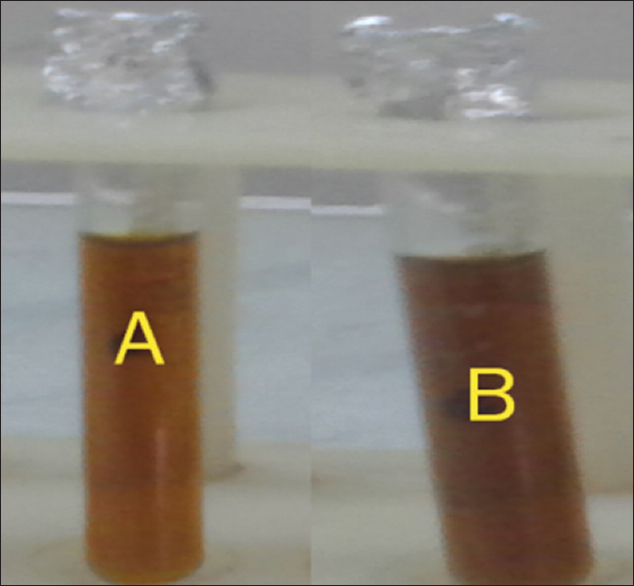 Materials and Methods: The 20 ml and 10 ml of C. longa stock extract were mixed with 10 ml and 10 μl of AgNO3solution (A) 1 mM and (B) 1M, respectively; reduction process initiates the formation of nanoparticles as detected by color change of AgNO3from brown to dark brown; thereafter, characterization done by ultraviolet–visible spectrophotometer, Scanning electron microscope, and transmission electron microscopy. Results: The synthesized and characterized C. longa silver nanoparticles induce targeted anticancer activity in breast cancer cells. Abbreviations used: μl: Microlitre; μg: Microgram; mM: Milli Molar; M: Molar; rpm: Revolution per minute; IC50: Inhibitory concentration at which 50% cells get died; PBS: Phosphate-buffered saline solution; DMSO: Dimethylsulfoxide; MTT: 3-4,5-dimethyl thiazole-2-yl)-2, 5-diphenyl tetrazolium bromide; DMEM: Modified eagle's media; DPPH-2,2-diphenyl-1 picrylhydrazyl; Abs: Absorbance. Nanotechnology deals with synthesis of nanoparticles of variable sizes, shapes, and chemical composition and can be prepared by physical, chemical, and biological methods. The Green chemistry is the most accepted method for the formation of nanoparticles by the use of plant materials. As far as the safety of biological synthesis procedures is concerned, the plant extract-mediated approach may act both as reducing agents and stabilizing agents in the synthesis of nanoparticles. In the present study, Curcuma longa rhizomes were selected for the synthesis of silver nanoparticles because C. longa known for its pharmacological potential, but it is also known for the less bioavailability. The pharmacologically active phytochemicals of C. longa are flavonoids and its diverse class responsible for its traditional remedial properties including aromatic, nonaromatic, volatile, and nonvolatile constituents. Among them, curcuminoids (diphenylheptanoids) include curcumin and its derivatives, demethoxycurcumin and bisdemethoxycurcumin being the major bioactive compounds in C. longa. The curcuminoids are yellow natural phenols that have antioxidant, anticancer, anti-inflammatory, and chemotherapeutic activities, but it is also known for the less bioavailability. The silver nanoparticles have the bactericidal activity and have shown to possess better antioxidant and anticancer potential for developing effective and safe novel therapeutic agents. Therefore, C. longa silver nanoparticles (CUR/AgNPs) have been synthesized and characterized for the prominent delivery and inducing targeted anticancer activity in MDA-MB-231 breast cancer cells. When the 20 ml and 10 ml of C. longa stock extract was mixed with 10 ml and 10 ml of AgNO3 solution (a) 1 mM and (b) 1M, respectively, the biosynthesis reaction started within few minutes and it was detected by color change and was monitored by ultraviolet–visible (UV-Vis) spectrophotometer. UV-Vis absorption spectra showed that bands contain peaks (410 for sample A to 425 nm for sample B) of CUR/AgNPs. In addition, transmission electron microscopy (TEM) analysis detailed that nanoparticles appeared to be spherical and single crystalline. It was also observed by SEM analysis that sample (A) consists particle size distribution which were <35.6 nm and a smaller size (∼1.10 nm), whereas in sample (B) particle size distribution with being <58.6 nm and a smaller size (∼2.34 nm). Finally, anticancer properties of synthesized CUR/AgNPs (A) and (B) were screened against MDA-MB-231 breast cancer cells. It was found that CUR/AgNPs (A) and (B) induce the cancer cell death by decreasing cell proliferation, inducing genotoxicity and apoptosis. Synthesized CUR/AgNPs (A) and (B) showed dose- and time-dependent anticancer activity. Additional research efforts are needed to enlighten the signaling mechanism for the lead to develop more effective actions for breast cancer. The biological amalgamation strategies for developing nanomedicine(s) are first-line therapeutic drugs to improve human health, especially if they are proposed for invasive applications. Among the various metal nanoparticles, plant extract-based silver nanoparticles are gradually getting preference since 2009 because the bioreduction potential of plant extracts is much faster for silver ions than the gold ions. The silver nanoparticles have the bactericidal activity and have shown to possess better antioxidant and anticancer potential for developing effective and safe novel therapeutic agents. As far as the safety of biological synthesis procedures is concerned, the plant extract-mediated approach may act both as reducing agents and stabilizing agents in the synthesis of nanoparticles. Thus, the biological synthesis of silver nanoparticles using plant extract-based protocol seems to be natural, simplistic, cost-effective, and safe for human therapeutic use and suitable for large-scale production. In the present study, Curcuma longa (family Zingiberaceae) rhizomes were selected for the synthesis of nanoparticles because it is used as traditional medicine for various diseases and has also been reported for possessing multiple pharmacological activities including antioxidant, anticarcinogenic, and immunological ones., The pharmacologically active phytochemicals of C. longa are flavonoids and its diverse class responsible for its traditional remedial properties including aromatic, nonaromatic, volatile, and nonvolatile constituents. Among them, curcuminoids (diphenylheptanoids) include curcumin and its derivatives, demethoxycurcumin, and bisdemethoxycurcumin being the major bioactive compounds in C. longa. The curcuminoids are yellow natural phenols that have antioxidant, anticancer, anti-inflammatory, and chemotherapeutic activities, but it is also known for the less bioavailability. Therefore, C. longa silver nanoparticles (CUR/AgNPs) have been synthesized and characterized for the prominent delivery and inducing targeted anticancer activity in MDA-MB-231 breast cancer cells. Fresh rhizomes of C. longa were collected from local market of Lucknow, and the taxonomic identification was made by National Botanical Research Institute (NBRI), Lucknow, India. The voucher specimen was numbered and kept in our research laboratory for further reference. The Modified Eagle's media (MEM), fetal bovine serum (FBS), antibiotics for animal cell culture used in the study were obtained from HiMedia. Silver nitrate, ethanol, MTT salt, acridine orange (AO), propidium iodide, 4',6-diamidino-2-phenylindole (DAPI) dye, and other chemicals were obtained by Sigma-Aldrich, USA. The breast cancer cells (MDA-MB-231) were obtained from National Centre for Cell Sciences (NCCS) Pune, India. The fresh rhizomes of C. longa were washed with distilled water and shade dried for more than 1 week and then sliced for making a fine powder of dried rhizomes by mortar and pestle. This powder was stored in a closed container for future use. C. longa fresh rhizome powder (1 g) was added to 1000 ml distilled water (solvent) and left for 24 h at room temperature. After 24 h, temperature was slightly increased for dissolving the rhizome powder which was followed by vigorous stirring for 2 h. At last, extract was filtered by Whatman Filter Paper No. 1 and filtrate was stored at 4°C for further uses. Two concentrations of AgNo3, 10 ml (1 × 10−3 mM) and 10 μl (1 M) were added to 20 ml and 10 ml, respectively, filtrate of C. longa followed by stirring 2 h at room temperature and left for 24 h in dark to avoid any photochemical reactions at room temperature. The reduction proceeded which was detected by the color changing of the formulation (A) and (B). Formulations can be stored at 4°C for >2 weeks. Characterization of CUR/AgNPs is essential to evaluate the functional aspects of the synthesized particles. After formation, CUR/AgNPs was subjected to ultraviolet–visible (UV-Vis) spectrophotometer (1800 Shimadzu) over the wavelength range of 300–800 nm after diluting the sample with Millipore water. Spectrum bands were influenced by the size, shape, morphology, composition, and dielectric environment of the prepared nanoparticles. Scanning electron microscope is a type of electron microscope that produces images of a sample by scanning it with a focused beam of electrons; the electrons interact with the atoms in the sample, producing various signals that contain information about the sample's surface and composition. Both samples (A) and (B) were characterized by SEM Sample fixation and dehydration on a glass grid and analyzed using SEM. The applications of AgNPs are highly dependent on the chemical composition, shape, size, and monodispersity of the particles. Two samples (A) and (B) were characterized by TEM to check the morphology and size of prepared CUR/AgNPs. Ten microliters sample was adsorbed on the carbon-coated copper grid and analyzed under a Jeol JEM 1400 TEM at 100 KV. Images were acquired using a Gatan Orius CCD camera and Digital Micrograph software. Human breast cancer cells (MDA-MB-231) were obtained from NCCS, India. These cells were grown as a monolayer in MEM, which was supplemented with 10% FBS and 1% antibiotic and incubated at 37°C in 5% CO2 with 95% humidity. The cells were maintained in 75 cm2 tissue culture flask. The MTT assay is a colorimetric, nonradioactive assay for measuring cell viability through increased metabolization of tetrazolium salt. MDA-MB-231 cells in the concentration of 1 × 106 cells/ml were taken into 96 well plates. Then, the cells were treated with different concentration of CUR/AgNPs (0–50 μg/ml) and incubated in the presence of 5% CO2 and 95% humidity at 37°C for 24and 48 h. MTT (5 mg/ml) was added to the incubated cells and then further incubated for another 4 h. The crystals were dissolved in 200 μl of dimethyl sulfoxide (DMSO), and the absorbance was measured by colorimetric at 570 nm with reference filter as 655 nm. 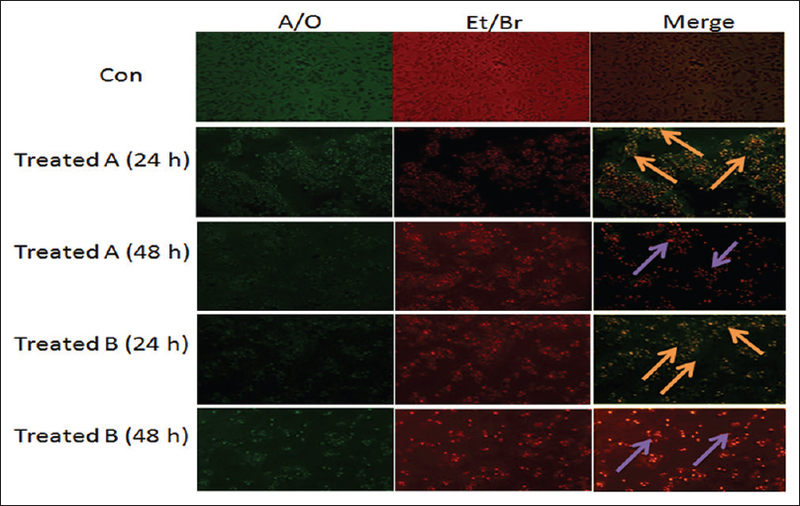 AO and ethidium bromide (EB) dual staining was carried out to detect induction of apoptosis on CUR/AgNPs treated (24 and 48 h) MDA-MB-231 cells. AO/EB dual staining is used to study the apoptotic and necrotic cells to visualize the cellular and nuclear changes with respect to live cells morphology. For this assay, 0.5 × 106 cells were treated with CUR/AgNPs for 24 and 48 h at 37°C. The cells were initially washed with phosphate-buffered saline (PBS) and then stained with EB (100 μg/ml) and AO (100 μg/ml). The cells were fixed in 3:1 ratio of methanol and glacial acetic acid for 1 h at room temperature and were examined under a UV illumination fluorescence microscope using the 20× objectives (Nikon 80i Eclipse, Japan) and the digitized images were captured. Several studies related to chemoprevention uses DAPI staining to observe the apoptotic changes at DNA level as a reliable apoptotic assay. Cells were cultured in a 24-well tissue culture grade plate for 24 and 48 h. After incubation with IC50 concentrations (μg/ml) of CUR/AgNPs, MDA-MB-231 cells were washed in PBS, fixed with 2% paraformaldehyde for 15 min, and were treated with 0.2% Triton X-100 in PBS for 15 min at room temperature. Cells after washing with PBS were stained with DAPI (2 μg/ml) and incubated in dark for 30 min. The cells were then examined and photographed using a fluorescence microscope (Nikon ECLIPSE Ti-S, Japan). The CUR/AgNPs treated (24 and 48 h) and un-treated MDA-MB-231 cells (20 × 103 cells per well on 24 well plate) were washed in ice-cold PBS and fixed in 75% methanol and 25% glacial acetic acid for 30 min in ice. Fixed cells were washed twice by PBS and stained with propidium iodide (PI; 30 mg/ml; Sigma) containing DNase-free RNase A (1 mg/ml) for 30 min at 37°C. Stained cells were washed in PBS and observed under a fluorescence microscope (Nikon). Fresh rhizomes of C. longa were used for the study. They were grown in controlled conditions in our laboratory taken from local market and identified by NBRI [Figure 1]. When the 20 ml and 10 ml of C. longa stock extract was mixed with 10 ml and 10 μl of AgNO3 solution (A) 1 mM and (B) 1M, respectively, the biosynthesis reaction started within few minutes and it was detected by color change, clear AgNO3 solution was changed into brown and dark brown color due to the excitation of surface plasmon resonance (SPR) which indicates the formation of CUR/AgNPs [Figure 2] The reduction process initiates the formation of nanoparticles that was monitored by UV-Vis spectrophotometer by diluting the sample with Millipore water and it was also used as blank. UV-Vis absorption spectra showed that bands contain peaks (410 for sample A to 425 nm for sample B) of CUR/AgNPs. We have obtained the well-synthesized AgNPs using two concentrations of silver nitrate (1 mM and 1M) with the help of exploring the effects of C. longa extract. The reactions were observed under the UV-vis spectroscopy to examine the bioreduction of AgNPs from aqueous AgNo3 solution. The shift changes of absorption peak appeared indicating difference in the size of the formed silver nanoparticles particles. There was a wavelength with absorption peak of 410–425 nm when different concentrations of C. longa extract reacted with different concentrations of 1 mM and 1M of AgNo3. The SPR wavelength shifts toward long wavelength region which indicated larger particle size [Figure 3]. The UV-vis absorption spectrum of the obtained CUR/AgNPs was compared under room temperature and by slightly increasing the temperature at different time intervals. The process under slightly increasing the temperature is more advantageous as it results in the formation of nanoparticles at a higher yield and slightly smaller size when compared with room temperature with a narrow size range < 58.6 nm are detectable [Figure 4]. In addition, TEM analysis detailed that nanoparticles appeared to be spherical and monodispersed. It was also observed by SEM analysis that sample (A) consists of particle size distribution which were <35.6 nm and a smaller size (~1.10 nm), whereas in sample (B), particle size distribution with being <58.6 nm and a smaller size (~2.34 nm) [Figure 5]. In the present study, CUR/AgNPs (A) and (B) synthesized and characterized and its anticancer activity on MDA-MB-231 cells was evaluated. It was observed that, after the treatment CUR/AgNPs (A) and (B), the viability of breast cancer cells was inhibited assessed by MTT assay. For the evaluation of inhibition of cell viability of cells, different doses of CUR/AgNPs (A) and (B) (0–50 μg/ml) were administered for 24 and 48 h to MDA-MB-231 cells. It was found from MTT assay that, viability of cells decreased as the dose and time increases [Figure 6] and at approximately 10 and 14 μg/ml treatment dose of CUR/AgNPs (A) and (B) respectively for 48 h of treatment, 50% cells viability was lost, i.e., IC50, as compared to untreated cells (control). The CUR/AgNPs (A) and (B) inducing early apoptosis detected by AO staining at 24 h of treatment, whereas EB, known to identify only dead cells, detected the MDA-MB-231 dead cells at 48 h of treatment. The dual staining of AO/EB detects the induction of apoptosis in MDA-MB-231 cells by CUR/AgNPs and changes associated with apoptotic cell death. The cells treated with concentrations of CUR/AgNPs (A) and (B) for 24 h [Figure 7] showed marked changes in morphology such as irregular shape, membrane blebbing, and the early apoptotic cells displayed greenish yellow nucleus with condensed chromatin at both the concentration of CUR/AgNPs (A) and (B) as compared to untreated (control), whereas at 48 h, the late apoptotic cells showed orange red nucleus with chromatin condensation and nuclear fragmentation. Apoptosis or programmed cell death is characterized by apoptotic morphology which includes membrane blabbing, chromatin condensation, degradation of DNA, and apoptotic body formation. The pictorial data of PI staining showed a marked difference between the control and treated CUR/AgNPs (a) and (b) MDA-MB-231 cells as morphological changes similar to apoptotic/dead cells were observed in the treated ones, whereas the untreated cells appeared round without any changes. The PI positive (apoptotic/dead cells) detected as bright yellowish red fluorescent cells at 48 h of CUR/AgNPs (a) and (b) cytotoxic treatment indicated by arrows in [Figure 8]. The genotoxic effect was detected with DAPI staining in MDA-MB-231 cells at 48 h treatment of CUR/AgNPs (a) and (b). The apoptotic cells were determined by condensed chromatin and fragmented nuclei which were shown by arrows in blue fluorescent-treated cells as shown in [Figure 9] as compared to control. It was also demonstrated from DAPI staining that CUR/AgNPs-induced apoptosis, which was consistent with the results of viability and cytotoxicity assay. The difference in size of the nanoparticles of sample A and B may be responsible for different doses concentration of IC50. As long as the anticancer activity of CUR/AgNPs (a) and (b) are taken into account, there is no such marked difference, but the IC50 doses of both samples are different. The plant crude extracts contain novel secondary metabolites such as phenolic acid, flavonoids, alkaloids, and terpenoids, which are mainly responsible for the reduction of ionic metal into bulk metallic nanoparticles. Primary and secondary metabolites are constantly involved in redox reactions required to synthesize eco-friendly nanoparticles. Biosynthesis reactions can be modulated to transform the shape and size of nanoparticles using different metal concentrations and amounts of plant extract in the reaction medium., Gericke and Pinches reported that the size of particles that form intracellular could be controlled by altering key factors such as pH, temperature, substrate concentration, and time of exposure to the substrate. However, the biochemical and molecular mechanisms of AgNPs biosynthesis remain feebly characterized and should be investigated to further optimize the process. For instance, characterization of biochemical mechanisms underscored the importance of phytochemicals, which may mediate biosynthesis. Improvements in chemical composition, size, shape, and dispersity of nanoparticles would permit the use of nanobiotechnology in a variety of other applications. AgNPs, especially their sizes, are of critical importance while depicting various activities. It has been observed that the AgNPs with smaller particle size have a stronger penetration ability and greater toxicity. A size dependent-controlled targeting of AgNPs can improve effectiveness in cancer treatment, as the cancer cells are different in pore size compared to other cells. It has been observed that synthesized CUR/AgNPs was spherical with such a size which is wildly recognized among a good range for anticancer drug delivery applications. Therefore, it is essential to execute biologically safe as well as effective natural compounds as anticancer and chemopreventive drugs that have already been extensively used in humans. 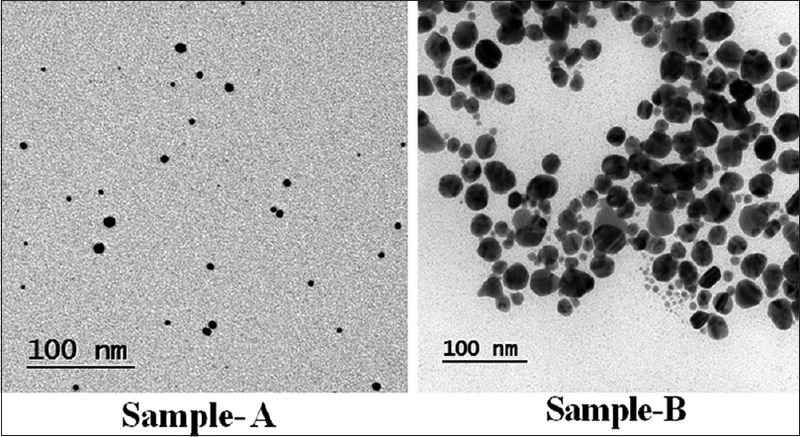 We have synthesized the C. longa silver nanoparticles with size ranges from (~1.10–35.6 nm) of sample (A) and (~2.34–58.6 nm) of sample (B). Various phytochemicals such as flavonoids, phytoalexins, and phenolic compounds have been used as adjuvants in the chemotherapeutic treatment of cancer. They can also act as biological response modifiers supporting immune system function and protect living cells against damage from free radicals. One such promising natural polyphenol compound found in C. longa is curcumin, known to inhibit the proliferation of various tumor cells in culture including breast cancer cells and prevents carcinogen-induced cancers in rodents. Chiu and Su showed that curcumin inhibited the proliferation of MDA-MB-231 cells either through upregulating p21 expression or upregulating the Bax to Bcl-2 ratio. Banerjee et al. reported that curcumin-induced G2/M arrest and apoptosis, inhibited cell proliferation by inhibiting the assembly dynamics of microtubules, and further activated the mitotic checkpoint in MCF-7 cells. Nevertheless, the preclinical and clinical studies related with oral administration of curcumin have revealed its very poor bioavailability. It has been found that CUR/AgNPs induces apoptosis which leads to breast cancer cell death. 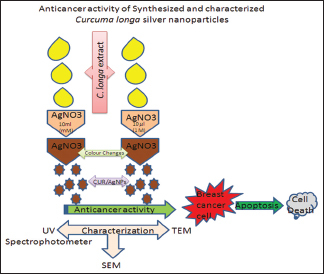 Consequently, C. longa silver nanoparticles synthesized and characterized accordingly in such a way so that it can overcome this problem and exemplify the effectiveness of curcumin and other phytochemicals. Further research is required to focus on the characterization of the mechanism behind the anticancer of CUR/AgNPs (A) and (B) may be the act same but follows different mechanisms of action. In outline, CUR/AgNPs have been successfully synthesized biologically using the C. longa extract as reducing agent and were characterized by various parameters. Finally, anticancer properties of synthesized CUR/AgNPs (A) and (B) were screened against MDA-MB-231 breast cancer cells. It was found that CUR/AgNPs (A) and (B) induces the cancer cell death by decreasing cell proliferation, inducing genotoxicity and apoptosis. Synthesized CUR/AgNPs (A) and (B) showed dose- and time-dependent anticancer activity. Additional research efforts are needed to enlighten the signaling mechanism for the lead to develop more effective actions for breast cancer. Authors are very thankful to Dr. Omkar (HOD), Department of Zoology, University of Lucknow for departmental research support and Dr. M. Arshad, Assistant Professor, for his valuable suggestions. The infrastructural support accorded by the Department of Zoology, University of Lucknow, Lucknow, is acknowledged. The author, Eram Sheikh thanks University Grants Commission, Government of India, for providing the Maulana Azad National Fellowship (senior research fellowship) for research. Arunachalam KD, Annamalai SK, Hari S. One-step green synthesis and characterization of leaf extract-mediated biocompatible silver and gold nanoparticles from Memecylon umbellatum. Int J Nanomedicine 2013;8:1307-15. Iravani. Green synthesis of metal nanoparticles using plants. Green Chem 2011;13:2638-50. Kumar, Yadav. Plant-mediated synthesis of silver and goldnanoparticles and their applications. J Chem Technol Biotechnol 2009;84:151-7. Mehrotra S, Agnihotri G, Singh S, Jamal F. Immunomodulatory potential of Curcuma longa: A review. South Asian J Exp Biol 2013;3:299-307. Labban. Medicinal and pharmacological properties of turmeric (Curcuma longa): A review. Int J Pharm Biomed Sci 2014;5:17-23. Miquel J, Bernd A, Sempere JM, Díaz-Alperi J, Ramírez A. The curcuma antioxidants: Pharmacological effects and prospects for future clinical use. A review. Arch Gerontol Geriatr 2002;34:37-46. Wilson B, Abraham G, Manju VS, Mathew M, Vimala B, Sundaresan S, et al. 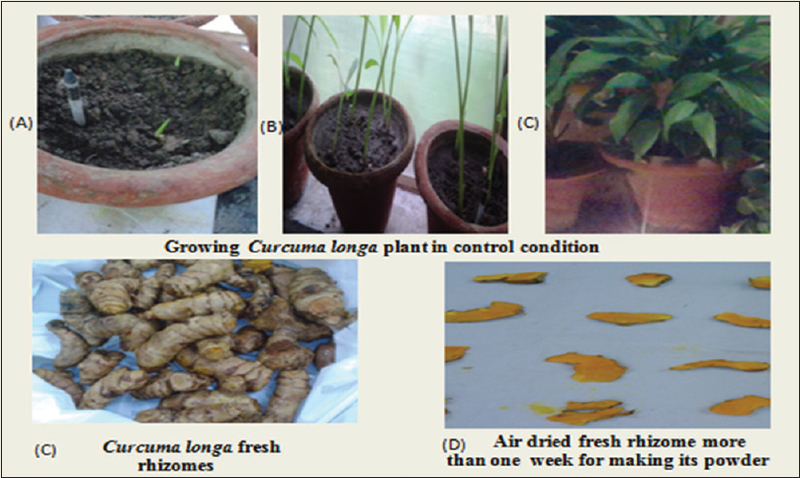 Antimicrobial activity of Curcuma zedoaria and Curcuma malabarica tubers. J Ethnopharmacol 2005;99:147-51. Ashraf JM, Ansari MA, Khan HM, Alzohairy MA, Choi I. Green synthesis of silver nanoparticles and characterization of their inhibitory effects on AGEs formation using biophysical techniques. Sci Rep 2016;6:20414. Sadhan KC, Shivani C, Lalit M. Plant mediated green synthesis of silver nanoparticles using Tecomella undulata leaf extract and their characterization. Nano Biomed Eng 2016;8. Sathishkumar M, Sneha K, Won SW, Cho CW, Kim S, Yun YS, et al. Cinnamon zeylanicum bark extract and powder mediated green synthesis of nano-crystalline silver particles and its bactericidal activity. Colloids Surf B Biointerfaces 2009;73:332-8. Sheikh S, Siddiqui S, Dhasmana A, Safia, Haque E, Kamil M, et al. Cissus quadrangularis linn. stem ethanolic extract liberates reactive oxygen species and induces mitochondria mediated apoptosis in KB cells. Pharmacogn Mag 2015;11:S365-74. Shilpa PN, Sivaramakrishnan V, Niranjali Devaraj S. Induction of apoptosis by methanolic extract of Rubia cordifolia linn in HEp-2 cell line is mediated by reactive oxygen species. Asian Pac J Cancer Prev 2012;13:2753-8. Aswathy Aromal S, Philip D. Green synthesis of gold nanoparticles using Trigonella foenum-graecum and its size-dependent catalytic activity. Spectrochim Acta A Mol Biomol Spectrosc 2012;97:1-5. Dubey SP, Lahtinen M, Särkkä H, Sillanpää M. Bioprospective of Sorbus aucuparia leaf extract in development of silver and gold nanocolloids. Colloids Surf B Biointerfaces 2010;80:26-33. Gericke M, Pinches A. Microbial production of gold nanoparticles. Gold Bull 2006;39:22-8. Park MV, Neigh AM, Vermeulen JP, de la Fonteyne LJ, Verharen HW, Briedé JJ, et al. The effect of particle size on the cytotoxicity, inflammation, developmental toxicity and genotoxicity of silver nanoparticles. Biomaterials 2011;32:9810-7. Carlson C, Hussain SM, Schrand AM, Braydich-Stolle LK, Hess KL, Jones RL, et al. Unique cellular interaction of silver nanoparticles: Size-dependent generation of reactive oxygen species. J Phys Chem B 2008;112:13608-19. Amendola V, Bakr OM, Stellacci F. Study of the surface Plasmon resonance of silver nanoparticles by the discrete dipole approximation method: Effect of shape, size, structure, and assembly. Plasmonics 2010;5:85-97. Albanese A, Tang PS, Chan WC. The effect of nanoparticle size, shape, and surface chemistry on biological systems. Annu Rev Biomed Eng 2012;14:1-6. Panda AK, Chakraborty D, Sarkar I, Khan T, Sa G. New insights into therapeutic activity and anticancer properties of curcumin. J Exp Pharmacol 2017;9:31-45. Liu D, Chen Z. The effect of curcumin on breast cancer cells. J Breast Cancer 2013;16:133-7. Chiu TL, Su CC. Curcumin inhibits proliferation and migration by increasing the Bax to Bcl-2 ratio and decreasing NF-kappaBp65 expression in breast cancer MDA-MB-231 cells. Int J Mol Med 2009;23:469-75. Banerjee M, Singh P, Panda D. Curcumin suppresses the dynamic instability of microtubules, activates the mitotic checkpoint and induces apoptosis in MCF-7 cells. FEBS J 2010;277:3437-48. Eram S, Bhatt ML, Madhu T. Role of nano-curcumin: A treatment for cancer. J Med Plants Stud 2017;5:394-7.